I know it's been a month since the last post but don't fret, I'm back! Just like how I mentioned in the last message, I just needed to take a break and recharge my batteries. Now that I feel inspired to start writing for fun again - I feel like writing a review. 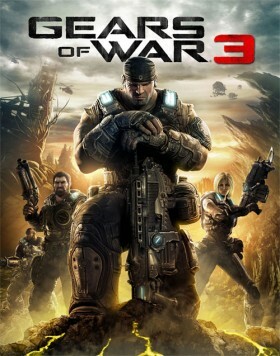 The game that I am going to be reviewing is the futuristic action-packed final installment of the Gears of War trilogy: Gears of War 3! The Premise: Several years after the fall of Jacinto, the remaining members of the COG elite have established their new base on a segregated island to plan a new existence; confident that the Locust threat was finished. 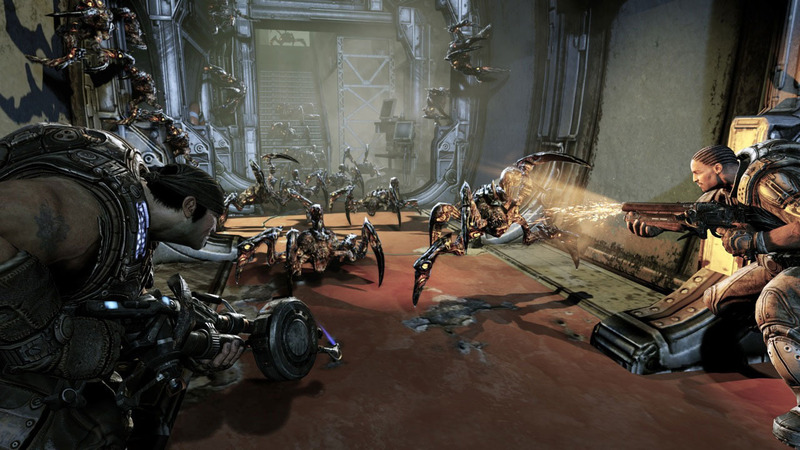 However, a powerful new enemy – The Lambent – emerge from below and devastate the remaining troops with their lambent-fuelled attacks and explosions. Forced into deteriorating bases around the world and traveling on mobile ships for a new safe haven, will the COG forces defeat this new threat or fall into disarray like current Locust troops? 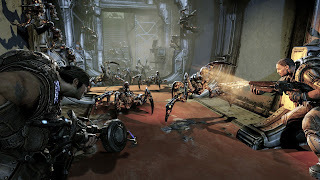 Some of the playable COG cast (L to R): Augustus Cole, Samantha Byrne, Damon Baird, Adam Phoenix, Anya Stroud and Dom Santiago. Returning once again to the forefront as the COG team leader is Marcus Phoenix, his second-in-command Dom, foul-mouthed yet intellectual Baird and former star athlete Cole. 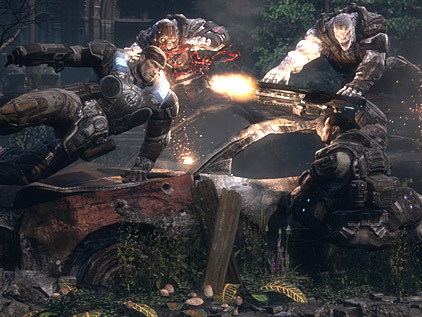 Gears of War 3 also introduces some new faces as playable members of the team: former lieutenant and radio voice Anya, cool-player Jace, no-face Carmine, southern gentlemen Dusty, tough-as-nails Bernie and ambitious Sam. To have a true war game, there has to be a villain leading the charge and that “person” is the queen of mean, Myrrah. 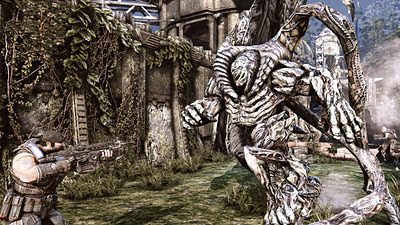 Where To Play: Similarly to the previous games in the series, you can only play the game on the Xbox 360. Once again for the basis of this review, I will be playing the game on the 360. The Good: I have to start out the positives with my favourite point. The multiplayer for this game was a drastic improvement compared to the previous installment. No longer did I have to wait almost 10 to 15 minutes between matches to find a game to join. This time it only took less than three minutes to join a match and I got to choose which setting I'd like. Also, the map levels and weapons were a definite upgrade. The Hammer of Dawn (a satellite which emits a laser against the opposite team) was properly balanced with a limit for usage. Since this was the last part of the trilogy (for this story), I hoped for an equally moving and developed storyline. I was pleasantly surprised because it took liberties like the second game - it added more to the storyline compared to spontaneous action. I liked how this game introduced new characters into the mix and provided female soldiers as allies. Previously, the only female characters you saw were either Strandeds, Anya's voice, Dom's dead wife or the villain queen. Nice change to provide a broader range of characters. The Bad: There wasn't much that I didn't like about this game. The AI of characters may have been flawed at points and the dialogue was alright, but my biggest pet-peeve had to have been the conclusion. I'm one of the many Xbox gamers who have played Gears of War since the first game was released and I was hoping for a cataclysmic finale. While the storyline did suit the needs of the trilogy, once it was all completed, it felt bittersweet. The defeat of the main villain seemed a tad abrupt once the final boss battle was completed and I expected more. I'm happy for the experience but there could have been so much more. For being the last of this trilogy, it was surprisingly a great end. The story tries to wrap up any lingering questions (though all questions will never answered) and provide a satisfying end to this storyline. The multiplayer alone is worth the buy and especially in this generation, having a game with an accompanying multiplayer is great add-on. If you're expecting this unbelievable ending with a conclusion that will provide you will every answer then you may be left empty. However, I recommend getting Gears of War 3 because you never know what the future holds for this series and this game will tide you over till the reports start coming in. Agree or Disagree with the review? Share your thoughts below and let us know what you think about the game. 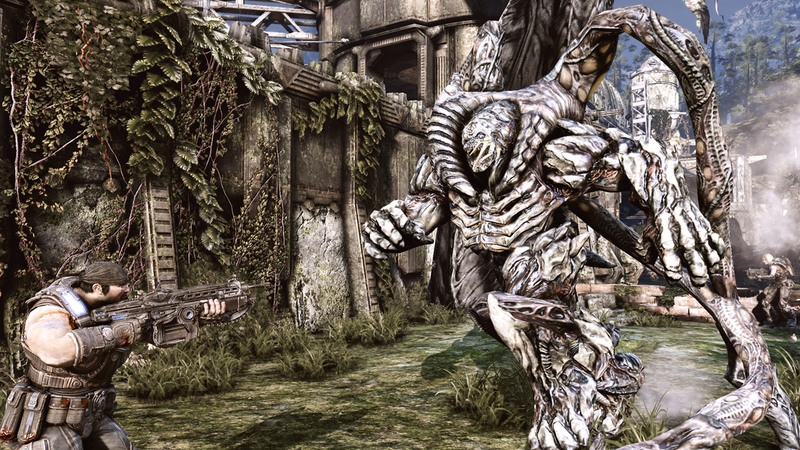 Most of the gamers recommend on Gears of war's characters which are truly disappointing. Whatever i like to kill more and more defeat men in Gears war 3 and multi player option was also too much amazing.